Happy Sunday :) I hope you are all enjoying a great weekend so far. I have a little something fun to share today...Probably my favorite type of paper craft. 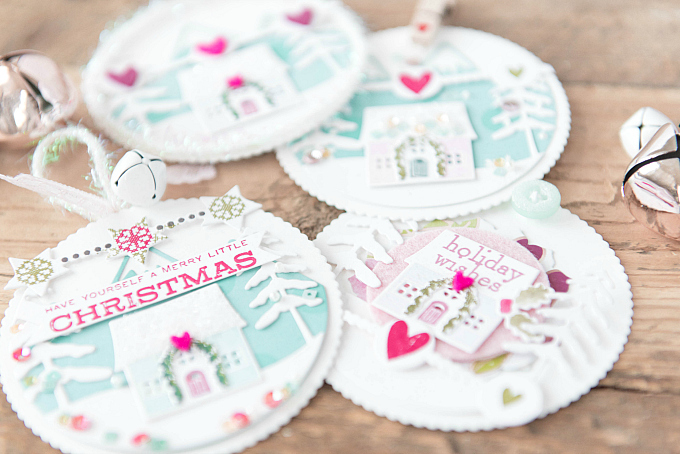 Miniature holiday tags, with oodles of teeny, tiny layers. Here's a little sneak of how I use all these little bits to make my tags come together. 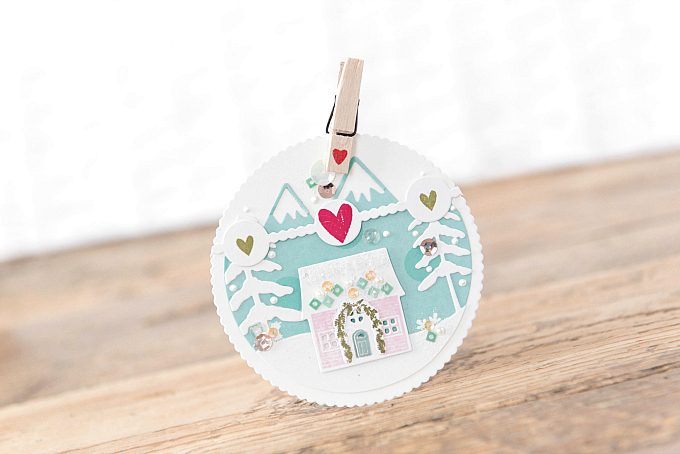 For me, there is nothing quite like cutting, decorating and assembling bitty little tags with colorful houses and sweet accents. Whenever I make batches of tags, I start by cutting everything out and then taking my time just playing. A little stamping here, and a bit of glitter there...So much fun! I made a big batch of these little tags, and I'll be using some for our Holiday gifting. For this first tag, I used Papertrey Ink's Scene It: Basic Backer die to create the background, and the Scene It: Mountain View die for both the mountains and pretty evergreens. For the little house and trimmings, I used the Petite Places: Home and Garden die and stamp, stamped in Lovely Lady, Ripe Avocado and Ocean Tides ink. I used Love Lives Here for the sweet little hearts, stamped in Pure Poppy and Ripe Avocado ink on a banner cut using Confetti Garland Borders. The bitty sequins are a retired favorite from Stampin Up, but you can find a similar product here. I used all the same products for the other tags, just arranged in a different way! You'll also noticed I tucked in a few little felt hearts on all of these tags, cut from PTI's Raspberry Fizz and Scarlet Jewel felt. All the little houses also got a generous sprinkling of glitter and for some I even added this pretty snow white trim. I rather love how easy it is to convert this beautiful Spring themed stamp set into a holiday set just by changing up the colors and accents. 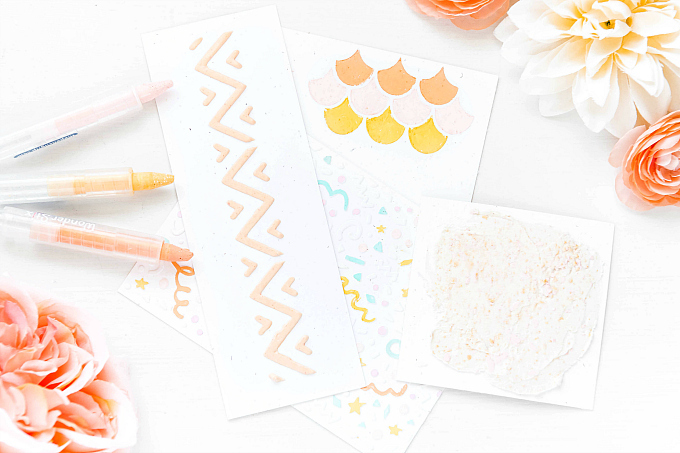 I love versatility with my crafting supplies, so whenever possible, I opt for products that can be used year-round...And these little stamps and dies definitely deliver! For the last little tag, I also opted to add in a bit of felt and a touch of patterned paper. It's such a joy to be able to mix and match all these sweet little layers into some fun and colorful tags! I think they will look mighty lovely tucked inside some glassine bags along with a few Holiday treats. Thanks for joining me friends! I hope you're well on your way towards Holiday preparations and enjoying this beautiful month of December. See you all soon! Ivana these darlings are the most precious ones!!! xoxo p.s love the quick little tutorial !! I commented on these over at SB.com but wanted to let you know again how adorable these were!! So glad you shared!! And how did you do that layering thing? Is that a GIF? These are my new favorites from you! The colors are dreamy and I love all of the special details you added. 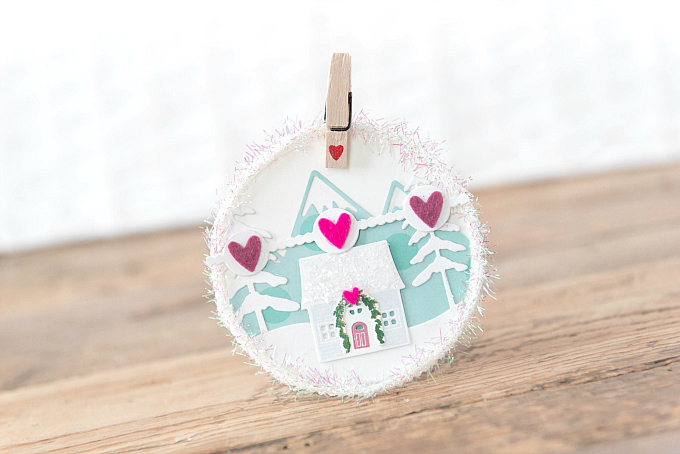 The simple pink felt circle is a wonderful little unexpected touch! Oh Ivana, your details are so so inviting and charming! such a fave, aren't they!?) Each one here is a dreamy creation!